A guard dog (not to be confused with the attack dog or watch dog) is a dog used to guard against, and watch for, unwanted or unexpected people or animals. The dog is discriminating so that it does not annoy or attack familiar people. Both guard dogs and watchdogs bark loudly to alert their owners of an intruder's presence and to scare away the intruder. The watch dog's function ends here; a guard dog is capable of attacking, or restraining the intruder. Livestock guardian dogs are often large enough, 100-200 lbs and strong enough to attack and drive away livestock predators such as wolves. Some smaller breeds (such as Keeshond and Tibetan Terrier) are excellent watchdogs but not guard dogs because they bark loudly to alert their masters of intruders but are physically small and not given to assertive behavior. Guardian breeds will bark to alert their master and to warn off an approaching animal, or human threat, prior to their interception of the trespasser. They are different from the smaller watchdogs in that they do not continue barking, they take action. The human shepherd would in many cases come to the guard dog's aid with a weapon, not letting the dog fend for itself. 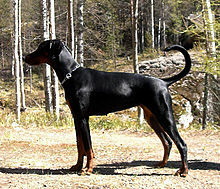 Breeds like this Doberman were specifically bred for guard duty. One of the first (British) police "K9" dogs was the Airedale terrier. Historically, it was a well respected British, German and Soviet military dog. 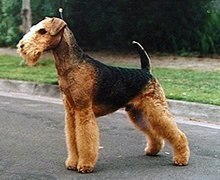 Airedales have fallen out of favor as guards, because they do not look as ferocious as other breeds when agitated. Such breeds include Dobermans, Rottweilers, German Shepherds, and Pitbulls. The bigger Oorang Airedales are as capable as the more familiar guardian breeds. In general, they are also more tenacious when aroused. Many currently prominent guardians started as general purpose farm dogs, but gradually developed into guard breeds. Such examples are Rottweilers, American Bulldogs, Bouviers, Swiss Mountain dogs and Giant Schnauzers. Some breeds, such as the Akita, Weimaraner and Rhodesian Ridgeback, were originally bred for hunting, but their large intimidating look and territorial instincts have helped them evolve into guard dogs in today's society. The Rhodesian Ridgeback is a determined defender of the home and can be very hostile to an enemy of its family. Some breeds, such as the American Pit Bull Terrier, were originally bred for fighting. Other breeds like the Dobermans, Boxers and Black Russian terriers were specifically bred as guard dogs. Many of the below breeds have a greater amount of molossoid or mastiff DNA. This is confirmed by a DNA study done on over 270 purebred dogs. It suggests that thirteen ancient breeds broke off early on, after which a group of mastiff style dogs were developed. These dogs are grouped with the mastiffs Great Dane and Irish wolfhound. The Irish wolfhound, (an ancient traditional hunting breed, used against the extinct giant Irish Elk, and the European wolf), has evidence that its population was nearly wiped out 200 years ago and its existing members descend from a very small group of dogs, thus it is a rebuilt breed, but evidently out of somewhat different building blocks. Beverly Pisano, in her book, Irish Wolfhounds, T.F.H publications,inc., writes that the Great Dane, Scottish Deerhound and Borzoi contributed to the resurrected Irish wolfhound. The modern Irish Wolfhound has a more peaceful temperament than its ancestor, the CU, of Ireland. Some Irish Wolfhounds have the power to excel as a guard, but too many of them have been bred to be passive for the show ring. The Anatolian shepherd, the Kangal, the Akbash, the Tibetan Mastiff, the Kuvasz, the Mid-Asian shepherd, Caucasian shepherd ( the Caucasian Shepherd,along with the East German Shepherd dog,guarded the Berlin Wall,to catch East Germans who wished to escape to the free West Germany) and the great white guardian breeds of Asia, are very serious guardian breeds. One flock guardian breed that could be classed as a superdog against predators, is the Komondor. Its bold personality and profuse coat of thick corded dredlocks protects them from predators fangs and claws, like a coat of armor. Most of the flock guardian breeds are more powerful than most police dog breeds, they are independent guards. They are family, property and flock protectors and will attack intruders, man or beast, without prompts from a master. The Belgian shepherd dogs, which look similar to the German shepherd, are gaining in popularity with police departments as an extremely quick and agile police dog. Israeli military malinois are amazing and videos of their performance can be looked up on the internet. The extraordinary American Pitbull terrier, Fila Brasileiro, Dogo Argentino, American Bulldog, Tosa Inu and Canary dog can be very dangerous to trespassers. The Fila, Dogo and Tosa are banned from the UK and Pitbulls must be microchipped, neutered and muzzled. The Canary dog or Presa Canario, is considered to be a natural fighting dog and should be carefully watched around other dogs.Some supporters of this breed refer to the Presa Canario as a "blood animal", meaning that it loves to fight. The Dogo Argentino was custom designed to be a powerful boar and puma hunter, though rarely used in fights. The Fila Brasileiro has a reputation of being a no nonsense guard and suspects almost all non family visitors. The Fila hunts Jaguar and was used in Brazil to run down escaped slaves, when slavery was a legal practice in Brazil. The Fila has a reputation for being very intolerant of guests to the home. Some breeds who make excellent guards, are more commonly having breed specific legislation passed against them, banning them from some communities and whole countries. Ironically, the UK, where most fighting dog breeds originated is the country who bans most "dangerous" dog breeds. Westminster, where dog shows are held, at one time was a dog fighting mecca. Because of these nationwide bans, tiny watch dogs may someday outnumber the more effective guard dogs, who can most effectively protect from violent outside threats to a household. Many landlords will not allow intimidating looking guard dog breeds and big game hunting breeds to live on their properties. The Moscow Watchdog, a Russian guard dog, crossbreed of the Caucasian Ovcharka and St.Bernard, is popular in Moscow. The Great Dane is a molosser, mixed with unknown sighthounds, to improve its agility and speed in boar hunting. The Great Dane is a mix of mastiff and coursing hounds, that was popular as a Boar hunter. The Dane is now sometimes referred to as the Deutsche Dogge, Germany claiming credit for the dogs origin. The Great Dane looks similar to the Broholmer, a nearly extinct Danish mastiff, so the Great Dane could actually truly be a Great Dane.Current Great Danes are considered to be less ferocious than the medieval specimens that hunted wild boar. The original Saint Bernard was used for alpine rescue in the Saint Bernard Pass by the monks. An avalanche killed off many of the dogs used for breeding. The Saint Bernards had to be bred with larger dogs such as mastiffs, which give it the large size and the guard dog instinct that the Saint Bernard has today. The Saint Bernard can be a stalwart guard: GRIZZ, a Saint, ran a Grizzly Bear away from his owner, saving her life. ^ "American Pit Bull Terrier". DogTime Media Network. Retrieved 2014-11-14. ^ "Genome sequence, comparative analysis and haplotype structure of the domestic dog". nature.com. 8 December 2005. pp. 803–819. doi:10.1038/nature04338. ^ "History of Belgian Malinois as Police Dogs". North American K-9. Archived from the original on 23 April 2014. Retrieved 28 December 2012. This page was last edited 22:10, 31 March 2015 by Wikipedia user Jdforrester (WMF). Based on work by Wikipedia users Lotje, Steven Walling and Ogre from Revenge of the Nerds and Wikipedia anonymous user 179.157.83.61.